The man behind LM Decals is Triantafyllos (Fyll) Metsovitis. For many years he has had an interest in the colours and markings of the vehicles of Greece and Cyprus. 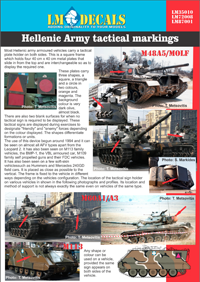 He has published a number of relevant articles in the IPMS-Hellas magazine "NEA", the MAFVA magazine "Tankette" and "Military vehicle" by the Hellenic Military Vehicles Preservation Association (HMVPA). He believes that markings are very important for a finished model's appearance and that an interesting and original set of markings can make a relatively commonplace model stand out. LM produce water slide decals for a wide range of vehicles in both 1.35 and 1.72. 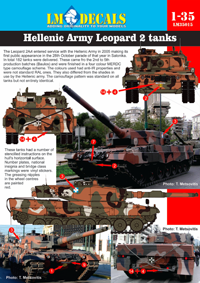 As far as Leopard fans are concerned, there is one sheet for Leopard 2 (LM35015). The same sheet is duplicated in 1.72 on one single sheet (LM72010). Most Hellenic army armoured vehicles carry a tactical plate holder on both sides. This is a square 40 cm x 40 cm frame which holds four metal plates that can display three shapes in orange or magenta. These are used during exercises to designate "friendly" and "enemy" forces and formations or units. These are also available in both scales (LM35010-2 and LM72008-2). Resin plates are included with each sheet (2 in 1.35 and 4 in 1.72). In 1.35 scale, the sheets for each tank is quite small, but they both cover markings for 13 Leopard 1 and 7 Leopard 2. Printed by Fantasy Printshop, they are very good quality. The instructions for these decals have to be downloaded as a PDF file from the LM website (or from the links below). To complement the quality of the decals, the instructions are very well researched and pack in a lot of information on four sides of A4. The Leopard 1 in Greek service is an interesting beast. 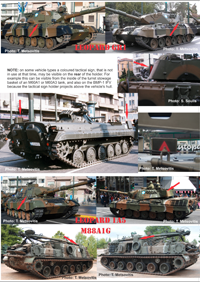 The Hellenic Army has used three different types and all of these are covered plus two experimental Leopard 1Vs fitted with EMES18 that were supplied to Greece. These tanks have all gone through changes in colour schemes over the years, and these are also covered in the instructions. Leopard 2A4 and 2HEL (2A6) are both in service in Greece and both types are covered. Unfortunately, there is no 2HEL model (or conversion) available at the moment, unless you fancy converting one of the Hobby Boss series of Leopard 2. It states in the instructions that any Leopard 2 in Hellenic service can be modelled by combining specific markings. The Greek camouflage schemes are some of the most interesting and certainly the most colourful, so if you would like a Leopard with a difference, we can thoroughly recommend these decal sheets.